One of the few names in K-town whose name itself is enough to create expectation for a film right from the day of its announcement is Director Shankar. His teaming up with Chiyan Vikram after the blockbuster of 2005, Anniyan just doubled the expectations. Shankar films are said to be shot under close surveillance and the Director is popular for guarding the details of his films from being leaked. However the Directors himself shared some interesting details of his latest films titled Ai and said its a romantic thriller which will be a new genre of sorts to come from him. The Director known for being updated with latest technology threw some light on the make-up crew employed for the film. The make-up is said to play a important role in the making of the film he was on the look out for the best make-up artistes in the world and finally zeroed in on eta work shop who were previously associated with Hollywood super hits like Lord Of The Rings and Hobbit. Shankar also said that the Weta Work shop people were highly impressed after hearing the script and had told that it will be a challenging task to work for such a film. People at the Weta were shown Shankar's 2010 blockbuster Endhiran which made them say that it is fresher than Hollywood films. They also had conveyed their willingness to work in the future projects of the most successful Director of the Tamil film industry without minding about the business. A few months back photos revealing Vikram's looks for the film and fans were surprised to see the experienced actor look like a youth who is fresh out of college. The Director said reducing wait for the character was not his insistence and he had just suggested the actor to go for a make-up change. it was Vikram's quest to experiment that he has opted for a toned look for the film. However the situations in the film necessitate a slim hero and Vikram's looks and performance in those scenes are sure to leave the audience spellbound as stated by the Ace Director. The Director also praised the actor as an epitome of dedication and recalled that he had only green vegetables during the shoot. . The Director said that he was initially suspicious of the suitability of the British girl Amy Jackson as the heroine of this film. However a test shoot made by Cinematographer P.C.Sreeram whom the Director is pairing up for the first time had cleared his doubts on casting Madarasapattinam girl. Shankar also said that they Amy was given the dialogues written in Tanglish and the girl will come prepared with them everyday. Finally the Director had loads of praise for P.C.Sreeram the of the acclaimed Cinematographers of Indian Cinema. Shankar said that working with P.C.Sreeram is a beautiful experience and it is a never before experienced challenge for him to conceive scenes for PC's visual frame. 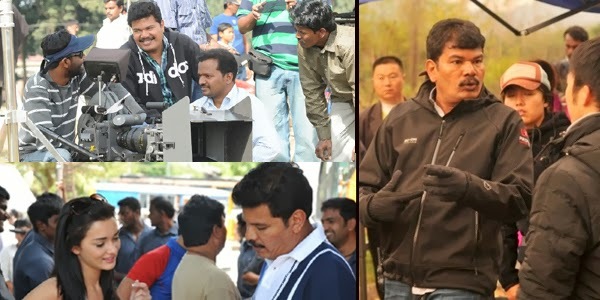 Shankar also said that the Cinematographer appears to be a tough person but those who have worked with him can understand that he is like a child. Sources say that AI has reached its last schedule which will include an action scene choreographed with an idea given by the Director himself, touted to be one of the best stunt scenes in Indian Cinema. It will feature Vikram and will be choreographed by international Stunt Choreographer Upen Patel. Fans can look out for sparkling romance and blast of action very soon. I love chiyaan Vikram Sir. he is my role module.